Today was a great example of why checking weather information before traveling is important. It was WAY too freaking hot. After taking a day off yesterday, my family and I were back on the train for another day of sightseeing in Tokyo. The first stop was Ginza. We wandered around the area, checking out the high end stores and the iconic Kabuki-za theatre. By noon, the temperature was creeping above 30 degrees. There are 30 degree days in central Canada in the summer, but there are two main differences between Tokyo heat and Winnipeg heat; humidity and urban heat islands. The humidity today was in the high 80% range. To compare, the average summer humidity in Winnipeg is around 50%. Humidity in the 80% range feels like walking around with a hot damp towel wrapped around you. This makes a hot day feel even hotter. Urban Heat Island is term used to describe cities being hotter than rural areas. Tokyo is largely concrete and steel with little green space. The general idea is that heat is absorbed instead of reflected, and plants are not able to cool the air by expelling water vapour. The effect on a hot, humid day is not very pleasant. We cut our trip to Ginza short due to the heat, but we did make sure to walk as close as possible to the automatic doors of the stores in the area. Every time they opened, we got a frosty cold blast of air conditioning. We retreated to the relative comfort of the subway system, and then moved on to Asakusa. 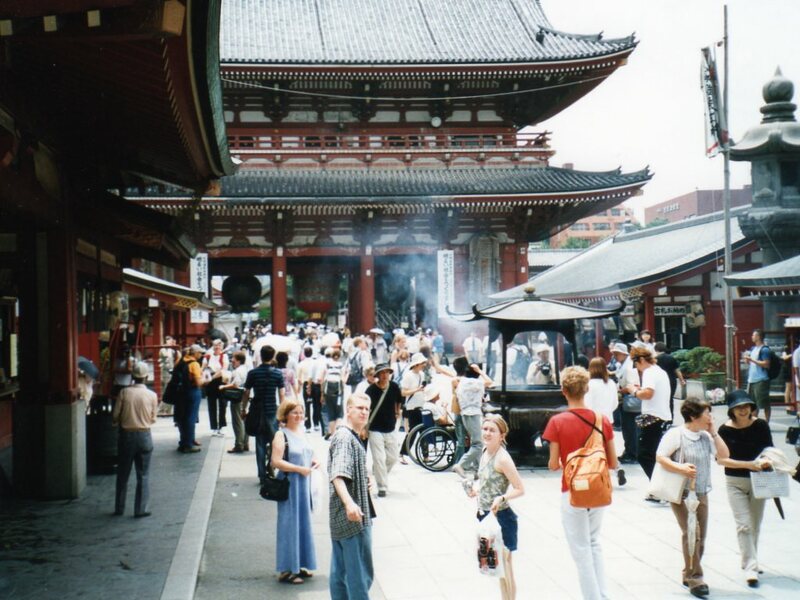 In my opinion, Sensoji temple is a required visit for all tourists in Tokyo. In my 9 months living in Japan this was my third trip to Sensoji, but it was still enjoyable. I helped my family buy souvenirs for friends and family at home. We didn’t have the longest day of sightseeing due to the heat, but it was still fun. We were all happy to get back to Hello House and turn on the AC. (2014 Update) My mom and sister still use the folding fans they bought in the stores leading to Sensoji 10 years ago. I did eventually get to watch kabuki in the Kabuki-za theatre, but not until 2006. Stay tuned faithful readers… stay tuned. This entry was posted on August 8, 2014, 8:28 am and is filed under Tokyo, Visitors. You can follow any responses to this entry through RSS 2.0. You can leave a response, or trackback from your own site.